Leo Demidov is an officer for the MGB. He believes everything they say, and he is accepting of their brainwashing propaganda, until Anatoly, an innocent vet, is killed. Leo becomes sick and misses work, which puts himself and his wife under investigation. Leo is ordered to spy on his wife and declares her innocent, so the two are sent to Voualsk. Leo works for the militia there. Meanwhile, someone has been killing children. The murderer hits Voualsk and Leo investigates. This gets him into trouble and he and Raisa are arrested and sent to the Gulags, but they escape. They travel to the town which they believe to be the eye of the killings, and discover that the murderer is Leo’s younger brother. Leo’s name is actually Palev, and he was stolen from his village as a young boy. The murderer, Andrei, is killing to get his brother’s attention, as he always knew he was alive. Leo confronts Andrei, and Vasili gets involved. Andrei kills Vasili, Leo and Raisa kill Andrei, and Leo is given his own homicide department. Raisa and Leo adopt two girls, whose parents were killed during the investigation of Anatoly. The book opens with two brothers hunting a cat. Their names are Andrei and Palev, and they capture the cat eventually. Then a man comes and kidnaps Palev, the older brother. Their mother tells Andrei that Palev was taken for food. Years later: Two different brothers are having a snowball fight. The older one hurts the younger one, who goes running off. The younger one is killed and his mouth is stuffed with soil. Leo Demidov works for the MGB in Stalin Russia. He is told to stop his current mission and go and tell Fyodor, a fellow member of the MGB and a friend, that his son hasn’t actually been murdered and his mouth wasn’t stuffed with soil. Leo tells Fyodor that he needs to stop saying that his son was murdered otherwise the MGB will lock him and his family up, because Stalin believes that murder is a capitalist crime and he wants none of that in his country. Leo goes back to spying on Anatoly. Or, rather, he tries to, but Anatoly has run off. Leo and his fellow MGB crew follow him to a small village, where they capture him and kill the family who were harbouring him (the father, Mikhail, was Anatoly’s friend). The two daughters of the couple are sent to an orphanage. Leo’s boss is angry because Anatoly disappeared on his watch, and Leo should have arrested him before this happened. Anatoly is interrogated. It turns out her really is only a vet and he just treated the wrong person’s pet. He’s executed anyway, but not before planting a small seed of doubt in Leo’s brain. Leo starts to question if he’s really fighting for the right side. Leo becomes sick due to overuse of amphetamines. He doesn’t show up for work and the MGB get angry. This is a criminal offence. They send a doctor over to determine whether or not Leo is really sick, or if he’s just faking it. If it’s the latter, the doctor is to sedate him until the boss man can assess the situation. The doctor tries to blackmail Raisa, Leo’s wife, into sleeping with him. She refuses and tells him to gtfo. He leaves. The MGB boss man shows up and excuses Leo. Leo gets back to work and the boss man tells him that Anatoly gave Raisa’s name during the interrogation, so Leo now has to spy on her to determine whether she is the enemy. Leo begins to doubt his wife. He follows her, but loses her when she gets off at a different stop than she should have. Leo is also being followed and he loses the guy and returns home. Leo goes to his parents’ house for dinner and asks what he should do with the Raisa situation. They say that they like their life and they wouldn’t be able to survive a prison sentence. Raisa shows up and tells them that she’s pregnant. Leo tells the MGB that Raisa is innocent and they both get arrested. Leo and Raisa are sent to Voualsk and Leo joins the police force there. He’s been severely demoted and is probably still being monitored. A prostitute is attacked by an MGB member but she gets away because they see the body of a young girl. A boy with a mental disorder is blamed for it because he cut some of her hair off. His name is Varlam and he has a thing for the colour yellow. Raisa admits that she was never pregnant, nor was she in love with Leo. She says she was afraid of him. Leo is kind of shocked because he thought they were in love. Raisa tries to leave him but she agrees to stay and help him with the investigation, as long as she is treated as an equal. Leo begins to investigate. He learns that the girl’s mouth was stuffed with soil. He goes to the scene of the crime and follows some footprints through the woods. 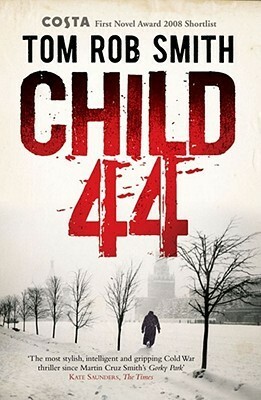 He and Raisa come across a boy’s body and Leo comes up with an intricate plot for the police to discover it. It doesn’t work out as it should, though, and they realise that Leo found the body in the first place. The head police guy tries to make out that the two cases – the boy and the girl – are unrelated, despite both having what Leo discovers is actually tree bark in their mouths. They go on the hunt for homosexuals. One hundred and fifty gay men are arrested and detained. None of them give up much information, because they don’t really know anything. Leo and General Nesterov go to an orphanage and get a name of a doctor, who they visit. He kills himself before the MGB can. We learn that the killer’s name is Andrei and he has been luring children into the woods and putting string around their ankles. He takes his glasses off before he kills them. Nesterov goes to the beach with his family. One of his children disappears and Nesterov and his wife panic. They start shouting about murders as they search the beach for their son. They find him and they leave, but someone calls the MGB on them because their behaviour is very suspicious. Leo and Raisa sneak back to Moscow and show Fyodor the map. They explain that they now think that Fyodor’s child was murdered, and they intend to kill the man who did it. Fyodor takes them to Galina, who says she saw the man who killed Fyodor’s son, but she refuses to say anything. Raisa takes Leo to Ivan, as she believes he can help them. However, it turns out that Ivan is a spy for the MGB and he attempts to turn them in, but Leo kills him and they escape. They go to Leo’s parents’ new apartment, which they share with other people. They have a chat and they part ways, and it is to be assumed that this is the last time they’ll see each other. They give Leo a letter to read on the train. Raisa and Leo board a train back to Voualsk, and Leo takes the letter to the toilet. He already knows what it’s going to say, and he rips it up and throws it out the window. They arrive back in Voualsk, and Leo goes to see General Nesterov. Nesterov tells Leo that the MGB are on their way, and he needs to leave the maps and evidence and run. Leo knows Nesterov out (with his permission) and escapes the building. He attempts to flee the village but he hits a literal road block and is arrested. Leo and Raisa are back in Moscow again. Leo is interrogated and he says his name is Palev. It turns out that Leo is really Palev, the boy from the beginning. The man who took him away really did take him to eat him. Rather, the man intended to feed Palev to his starving son, but his son – Leo – died before he arrived back with the “meal”. The two people we know as Leo’s parents adopt Palev, and give him Leo’s identity. Obviously, Leo/Palev and Andrei are brothers. We meet Andrei’s daughter, Nadya, who really despises her father’s cat. Raisa and Leo are put on a train to be sent to the Gulags. They ask their fellow prisoners to help them escape, stating that they intend to kill the monster who is killing children. Leo rips up the floorboard and he and Raisa jump out. They head to a village and the people there help them. The MGB arrive and the villagers hide them. They then make their way to Rostov. Leo and Raisa go to the factory where Andrei works and Leo realises that it’s his brother. They go to his house and Leo goes inside. Leo meets his brother again. Andrei tells him that he killed the children to get Leo’s (or Palev’s) attention because he wanted him to come back. Andrei believes that Palev abandoned him. Raisa enters the house and sees Leo playing cards with Andrei. Vasili then follows them inside, and he is threatening to kill Leo and Raisa when Andrei stabs him in the back and kills him. Leo takes Vasili’s gun and he and Raisa shoot Andrei together. The MGB rush inside and Leo says that Vasili was killed while trying to kill the murderer. Leo is offered a promotion back in Moscow but he suggests that he be allowed to open up his own homicide branch instead. So he does. Leo and Raisa adopt (and rescue) Mikhail’s two children from the orphanage in the hopes of giving them a better life.